The Billroth I procedure was pioneered by Dr. Theodor Billroth in 1881. 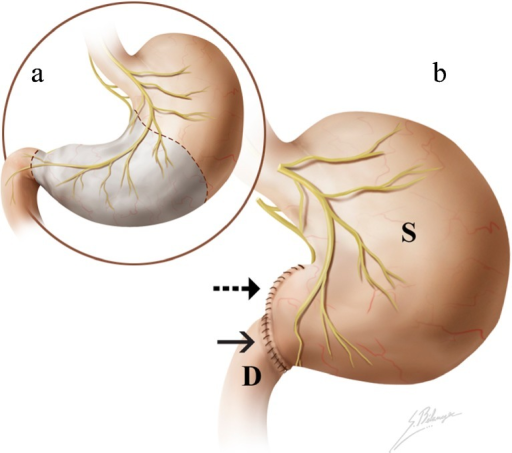 The original procedure was described as a "subtotal gastrectomy" where gastrointestinal continuity after the resection was attained with an anastomosis between the stomach and the duodenum, a gastroduodenostomy. After Billroth's pioneering work, several variations on the procedure appeared (Polya, Hofmeister) as well as different techniques (open vs. laparoscopic), and the use of different materials, starting with carbolized silk to the modern endolaparoscopic surgical staplers. For more information, click on the image and you will be redirected to a page by the National Institutes of Health. For a video of the open Billroth I procedure on YouTube click here. Image and links courtesy of: National Institutes of Health.